Awarded by EITB and named “Zeu Zara EiTB” the Miranda Fundazioa Foundation has taken the prize to Solidarity competing against consolidated companies in its sector. VDA. Sainz, a company that collaborates in its project, joins the congratulations received for the award. In order to get closer to citizens, the Basque broadcaster, EITB has created a series of awards that recognize the work of companies in different sectors in the context of a particular locality. 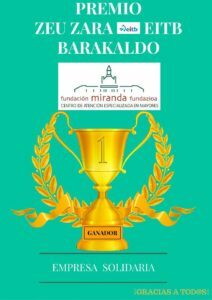 It has begun in Barakaldo, where the Miranda Foundation operates. Dedicated to the attention to the most disadvantaged elderly of Barakaldo, the Miranda Foundation shares with Vda. Sainz principles based on achieving higher quality levels, improvement, progress and humanity in the immediate present, destined to continue in the future. They are also aware of the important role that any entity plays in our society. The undersigned collaboration acknowledges, meanwhile, the growing importance of these institutions to develop a work of incalculable weight and persist through donations and sponsorships. The Miranda Foundation is an institution of great social significance with more than a hundred years of solidarity trajectory. Its staff manages a Specialized Care Center for Elders on providing individualized, comprehensive and continuous care to residents and relatives based on a Centered Care to the Person. And all this justifies that in the award of EITB, it has been win to companies in the category of Caritas-Social dining of Barakaldo, Usoa Work Center, Goiztiri Elkartea Association and Ntra. Señora del Carmen of Barakaldo Association (Food Bank). Meanwhile, in the coming months, EiTB will go out and give voice to the associations, cultural and sport centers of each of the municipalities that they visit. In addition, its history, its festivals and its strategic and future projects will be discussed. The gala awards ceremony will be screened live on www.eitb.eus and will be held on July 13th at the Barakaldo Antzokia Theater at 20 h., And it will be presented by the journalists Urko Aristi and Almudena Cacho.